For the baseball pitcher, see Giovanni Soto. Geovany Soto (born January 20, 1983) is a Puerto Rican professional baseball catcher who is a free agent. He has played in Major League Baseball (MLB) for the Chicago Cubs, Texas Rangers, Oakland Athletics, Chicago White Sox and Los Angeles Angels of Anaheim. He has appeared in the MLB All-Star Game and was named the National League Rookie of the Year in 2008. Selected by the Chicago Cubs 318th overall in the 11th round of the 2001 Major League Baseball draft, he made his major league debut on September 23, 2005, against the Houston Astros. He was recalled by the Cubs on July 12, 2007, but only had 1 hit in 7 at-bats. In September 2007, when the Cubs expanded their roster, he joined the team again. This was mainly because, in the minor leagues that year, he batted .353 with 26 home runs and 109 RBI and was named the Pacific Coast League's MVP while playing for the Iowa Cubs. After his call-up in September, Soto had an average of .389. Soto started for the Cubs during the 2007 playoff series against the Arizona Diamondbacks. In game 2 of the series, Soto hit a home run into the left field bleachers at Chase Field, giving the Cubs an early 2–0 lead. The Cubs ended up losing that game, but it further solidified him as the Cubs' full-time catcher going into 2008, with Jason Kendall moving on to Milwaukee as a free agent. 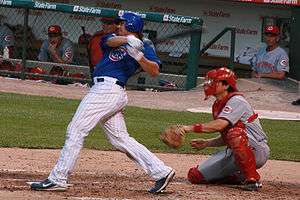 Soto batting for the Cubs against the Cincinnati Reds. Arguably the best offensive performance in Soto's career came April 30, 2008, in a rout against the Brewers. Soto hit two 3-run homers to account for 6 of the Cubs' 19 RBIs, only a few days removed from a two-game stretch against the Nationals in which he struck out in 8 consecutive at-bats. Soto was voted the National League Rookie of the Month for April 2008 after hitting .341 with 5 home runs, 8 doubles, and 20 RBIs, with an OPS of 1.059. On May 19, 2008, he scored his first career Inside-the-park home run against the Houston Astros. Soto led the early stage of the voting process for the National League's catcher in the 2008 Major League Baseball All-Star Game. He was selected to be the National League's starting catcher in the game. Soto became the first rookie catcher ever to start on the National League All-Star team. Soto is the first Cubs' All-Star rookie to play in the game with at least 14 home runs since Rafael Palmeiro did it in 1987, surpassing the mark when he hit his 15th home run on July 6, 2008. He went 3 for 5 with 7 RBIs in a game on August 26 against the Pittsburgh Pirates. As a rookie catcher, Soto called a no-hitter game from behind the plate to pitcher Carlos Zambrano in a game against the Houston Astros on September 14, 2008. Played at Miller Park in Milwaukee due to Hurricane Ike moving through Houston, this was the first no-hitter in major league history pitched at a neutral site. After the 2008 season, Soto was honored with the Sporting News Rookie of the Year Award and the Major League Baseball Rookie of the Year Award for the National League. Soto posted a .285 batting average, along with 23 home runs and 86 RBI's.Soto won the award in a landslide, receiving 31 of 32 first place votes. Soto is the first Cubs' backstop to play for multiple Cub playoff teams since Gabby Hartnett, and is the first to start playoff games in consecutive years since Johnny Kling. Soto also won the Pedrín Zorrilla Award, receiving unanimous support during the voting process. Orlando Cepeda was contacted to present the award, traveling to Puerto Rico for the ceremony. Soto was unable to live up to huge expectations in 2009, only posting a .218 batting average and 47 RBI. In June 2009, Soto was revealed to have tested positive for marijuana at the World Baseball Classic. While the MLB did not take any disciplinary actions, the International Baseball Federation has banned him from playing internationally for two years. In 2010, Soto batted .280 with 17 home runs. In 2011, Soto batted .228 with 17 home runs. He led major league catchers in errors committed, with 13, and had the lowest fielding percentage, at .987. On July 30, 2012, Soto was traded to the Texas Rangers for right-handed pitcher Jake Brigham. In 47 games with Texas in 2012, he hit .196 with 5 HR and 25 RBI. Soto spent 2013 as the backup catcher to A. J. Pierzynski. On June 4, 2013, Soto played his first career game at third base. On July 29, Soto hit a walk-off home run against the Angels. The Rangers entered the bottom of the ninth down by 1 before Pierzynski, the designated hitter, hit a solo home run to tie the game. In 54 games in 2013, Soto hit .245/.328/.466 with 9 HR and 22 RBI. On November 5, Soto signed a one-year, $3.05 million deal with incentives with the Rangers to be their primary catcher. Due to injuries to his knee and foot, Soto was on the disabled list for the first half of the 2014 season. On July 9, 2014, Soto was arrested on a charge of cocaine possession. On August 24, 2014, the Rangers traded Soto to the Oakland Athletics for cash considerations. He appeared in 11 games and batted .262 with 8 RBI. Soto signed a minor league deal with the Chicago White Sox on January 22, 2015. On November 24, 2015, Soto signed a one-year, $2.8 million contract with the Los Angeles Angels of Anaheim. 1 2 "Stats: Individual Player Game Log – Geovany Soto C". Major League Baseball. Retrieved May 22, 2008. ↑ "Player Statistics: Geovany Soto". Minor League Baseball. Retrieved May 22, 2008. ↑ Mike Scarr (May 9, 2008). "Soto catches Gillette rookie honor". Major League Baseball. Retrieved May 22, 2008. 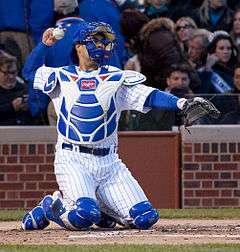 ↑ "Geovany Soto's inside-the-park homer paces Cubs' 7–2 win". Los Angeles Times. May 20, 2008. Archived from the original on May 21, 2008. Retrieved May 22, 2008. ↑ Lester Jiménez (July 1, 2008). "Soto se consolida en la votación" (in Spanish). Primera Hora. Retrieved July 1, 2008. ↑ Carrie Muskat (July 6, 2008). "Cubs send seven to All-Star Game". Cubs.com. Retrieved July 7, 2008. ↑ "Geovany celebró con su 15to. bambinazo" (in Spanish). Primera Hora. July 7, 2008. Retrieved July 8, 2008. ↑ "Geovany Soto estuvo colosal con siete remolcadas" (in Spanish). Primera Hora. August 27, 2008. Retrieved August 27, 2008. ↑ Roberto Colón Segarra (September 16, 2008). "Gesta con toque criollo" (in Spanish). Primera Hora. Retrieved September 16, 2008. ↑ Carrie Muskat (October 22, 2008). "Soto, Longoria recognized by players". Retrieved October 22, 2008. ↑ "Rays' Longoria, Cubs' Soto win rookie of year awards". November 10, 2008. Retrieved November 10, 2008. ↑ "2008 MLB Awards: NL Rookie of the Year". November 10, 2008. 1 2 ""Peruchín" Cepeda encabeza acto en honor de Soto" (in Spanish). El Expresso de Puerto Rico. November 26, 2008. Retrieved January 13, 2009. ↑ "Geovany Soto embarrassed by positive drug test at World Baseball Classic". Chicago Tribune. Retrieved June 25, 2009. ↑ "Cubs' Soto won't be suspended for positive marijuana test at WBC". CBSSports.com. June 25, 2009. Retrieved July 11, 2009. 1 2 "Geovany Soto Statistics and History". Baseball-Reference.com. Retrieved December 15, 2013. ↑ "2011 Major League Baseball Fielding Leaders". Baseball-Reference.com. Retrieved December 15, 2013. ↑ "2013 Regular Season MLB Baseball C Fielding Statistics – Major League Baseball – ESPN". Espn.go.com. Retrieved December 15, 2013. ↑ Nicholson-Smith, Ben (July 30, 2012). "Rangers Acquire Geovany Soto". ↑ Durrett, Richard (November 5, 2013). "Rangers: Geovany Soto is 'primary' catcher". ESPN Dallas. ↑ "Royals acquire RHP Jason Frasor from Rangers". ESPN.com. Associated Press. July 16, 2014. Retrieved July 17, 2014. ↑ "Rangers C Soto arrested for marijuana possession". Associated Press. July 11, 2014. Retrieved July 12, 2014. ↑ Watkins, Calvin (August 24, 2014). "A's acquire Geovany Soto". ESPN.com. Retrieved August 24, 2014. Wikimedia Commons has media related to Geovany Soto.